Mini Pumpkin Pies are the only thing better than pumpkin pie – they’re an entire pumpkin pie in ONE bite! Simple and so delicious! You guys all know that my FAVORITE season of the year is fall. If it’s pumpkin and spice and everything nice, I’m all in. I don’t know what the weather is like in your neck of the woods, but it’s downright freezing here in Ohio. Seriously, I’m not even being dramatic, it was exactly 32 degrees when I woke up at 6:30 this morning. I’m also not exaggerating when I say it went from 85 degrees two weeks ago to the low 40’s in a matter of days. And guys, I totally feel like I’ve been cheated out of those glorious, sunny, crisp, fall afternoons when the temps hover in the low 60’s. That weather is seriously the stuff my dreams are made of. Cool enough for a hoodie and leggings, but not cold enough to require a coat. In fact, I bought Elle a new fall jacket and we had to skip it entirely for her winter coat, complete with furry kitty earmuffs and gloves. I will tell you one thing, this weather has definitely gotten me in the mood to bake all the things. Partially to warm my house without turning the heat up too high, and partially because pumpkin season is here. And pumpkin anything is pretty much my favorite thing! I mean, in case you hadn’t noticed by the number of pumpkin recipes I’ve made over the years. 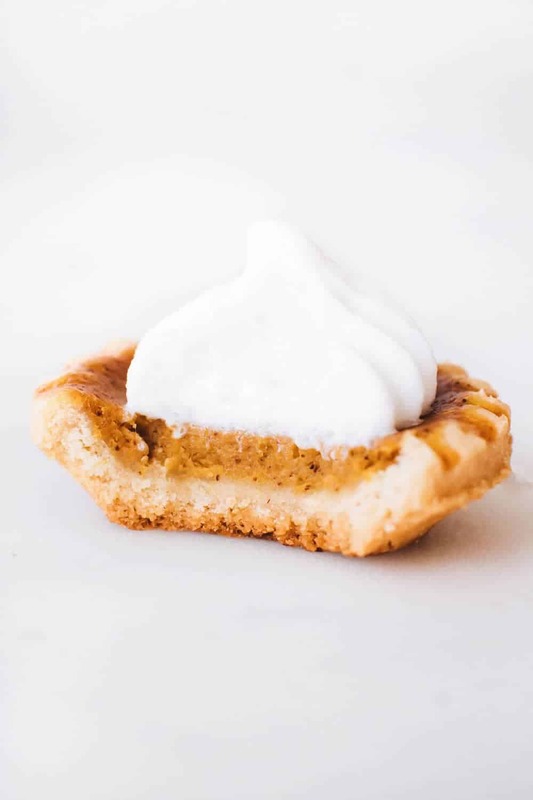 These Mini Pumpkin Pies have been a fan favorite for years, so this year, I decided to spruce up the recipe post with new photos to show you just how simple and delicious they are. What could be better than my favorite kind of fall pie? My favorite kind of fall pie in mini form. 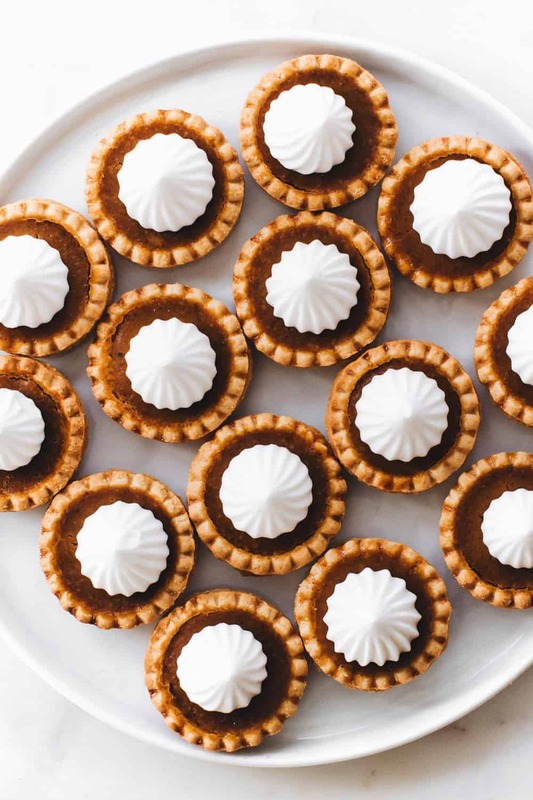 These Mini Pumpkin Pies are super easy to make and are seriously the most perfect little treat for any party or gathering. And they’re totally poppable. No need for forks or spoons. Just pick up one of these little cuties and pop it directly into ya’ mouth! I had to stop myself from popping these Mini Pumpkin Pies into my mouth repeatedly. What can I say? I was trying to dull my senses with pumpkin goodness while a Browns game droned on in my living room. If you’re from Cleveland, you know how painful the games are, so ya feel me, right? 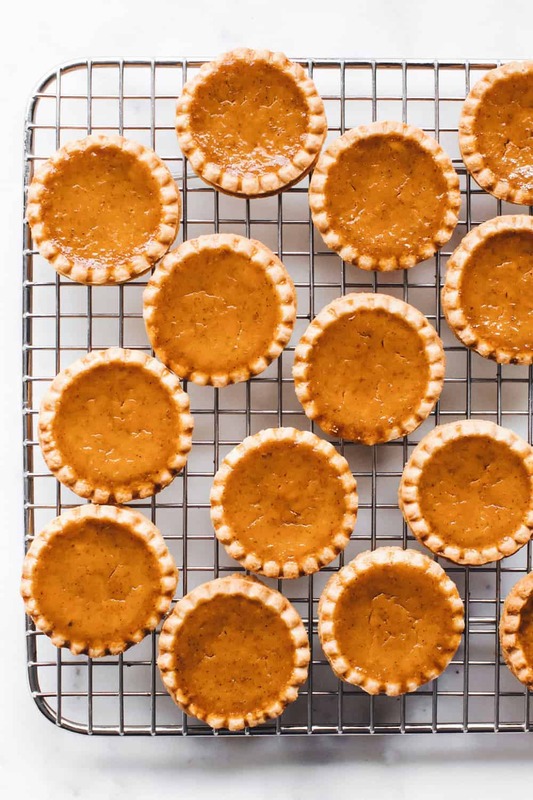 These Mini Pumpkin Pies are seriously so good. Just don’t forget the little dollop of whipped cream, or Cool Whip! It’s a total must. Sure, a full-sized pumpkin pie is great, but Mini Pumpkin Pies are perfect for parties or just, you know…snacking. 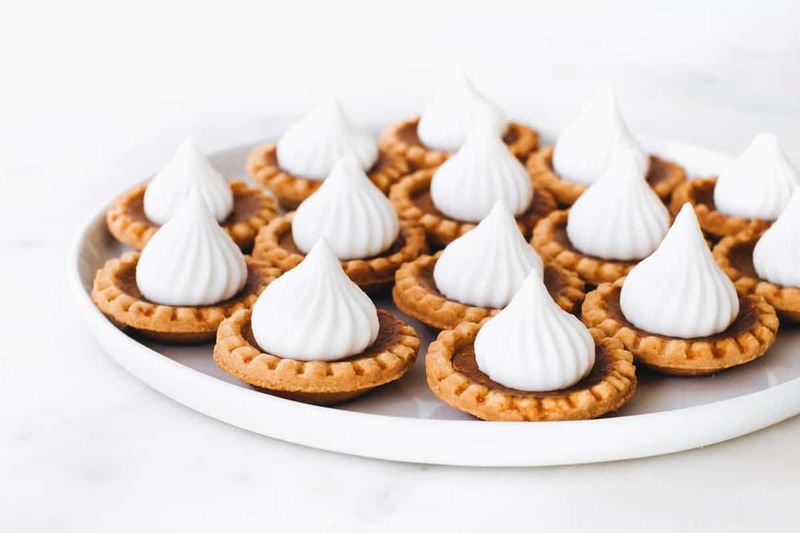 Several years ago I discovered mini shortbread pie crusts which I used to make some Mini Lemon Meringue Pies. I swear, I think it caused a rush on them at my local grocery store (lookin’ at you, Lori!). 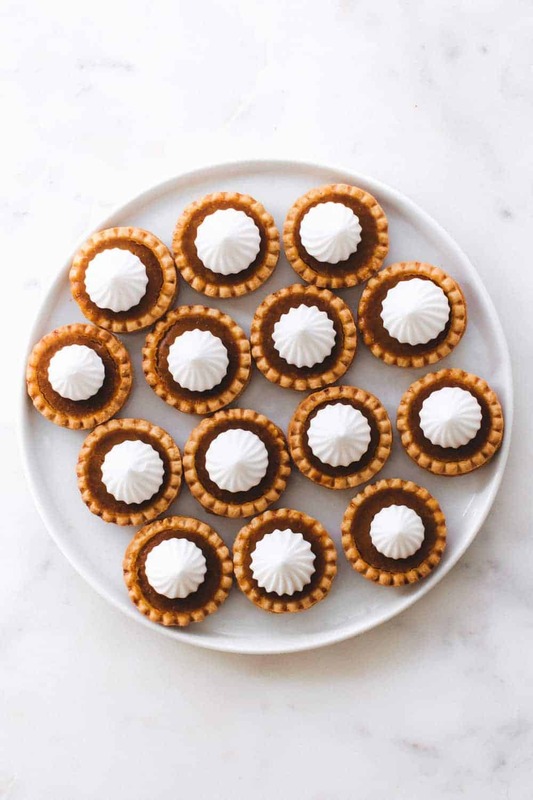 Since then, I have also used these mini tart shells to make Mini Sweet Potato Pies and Mini Salted Caramel Chocolate Pies. 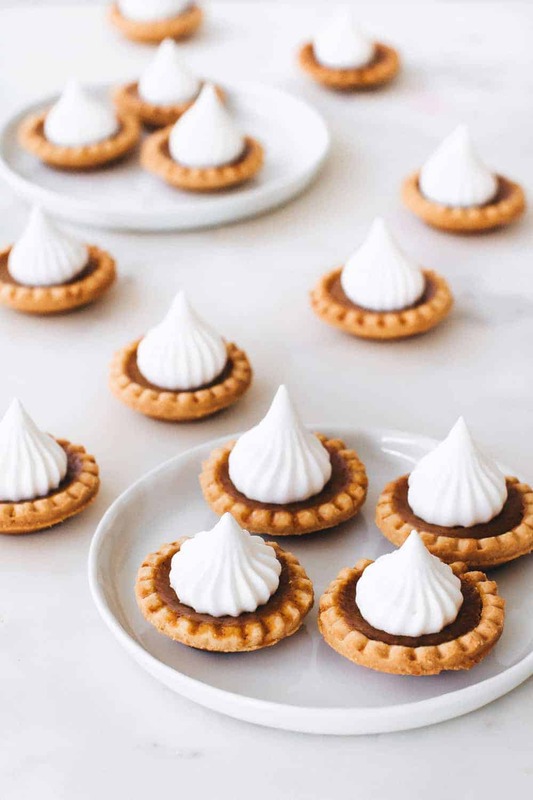 This Mini Pumpkin Pie recipe in these same little shells is no less awesome. Because they’re already pre-baked, they’re super quick to pull out of the freezer and have mini pies ready in almost no time. I am able to find mini tart shells pretty easily at my local market. If you can’t find them near you, you can order them on Amazon. Just make sure you check at your local store first, because they tend to be cheaper locally for me than from Amazon. 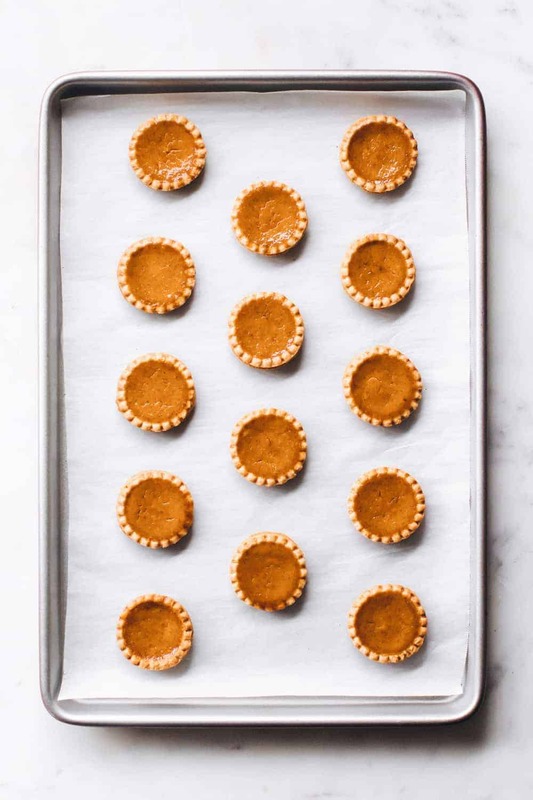 Once you have your mini tart shells, Mini Pumpkin Pies are only about 30 minutes away. 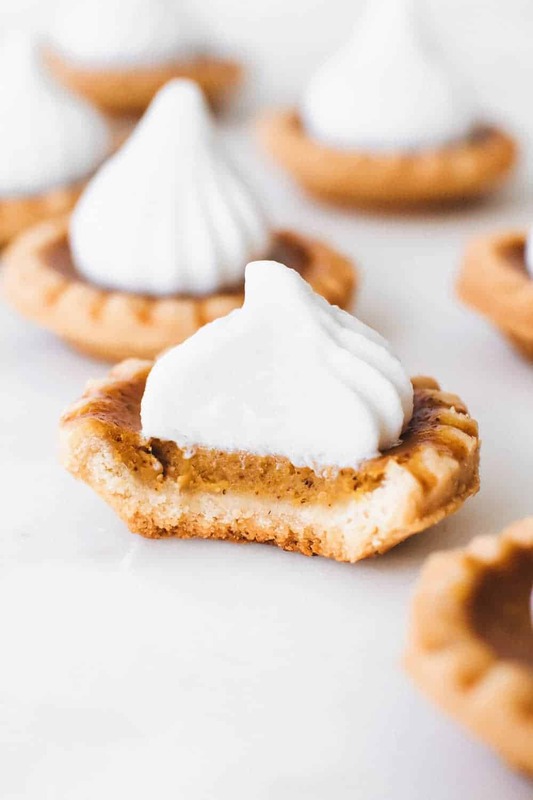 With this Mini Pumpkin Pie recipe, all you have to do is whip up a simple pumpkin pie filling, fill your shells and bake. 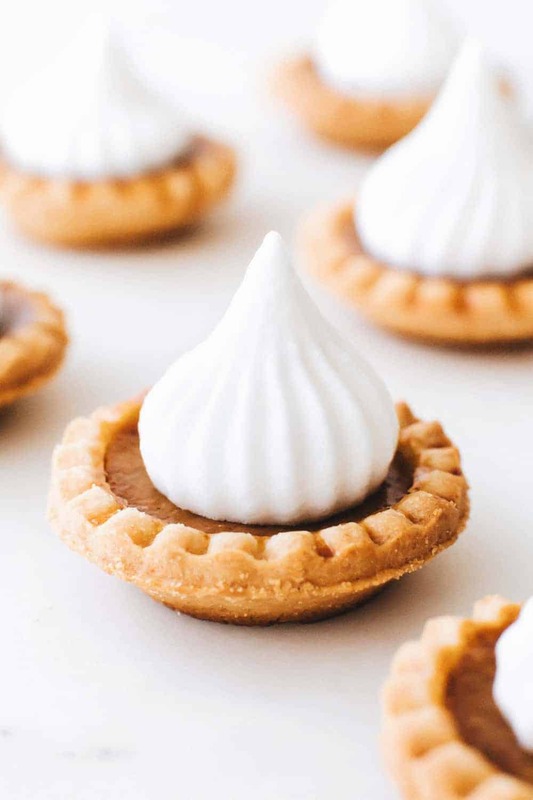 I like to garnish my Mini Pumpkin Pies with homemade whipped cream, but I have also been known to top them with Cool Whip when I’m on a time crunch. Feel free to get creative with your garnish, though! Candied Pecans would be a unique and delicious garnish, for example. 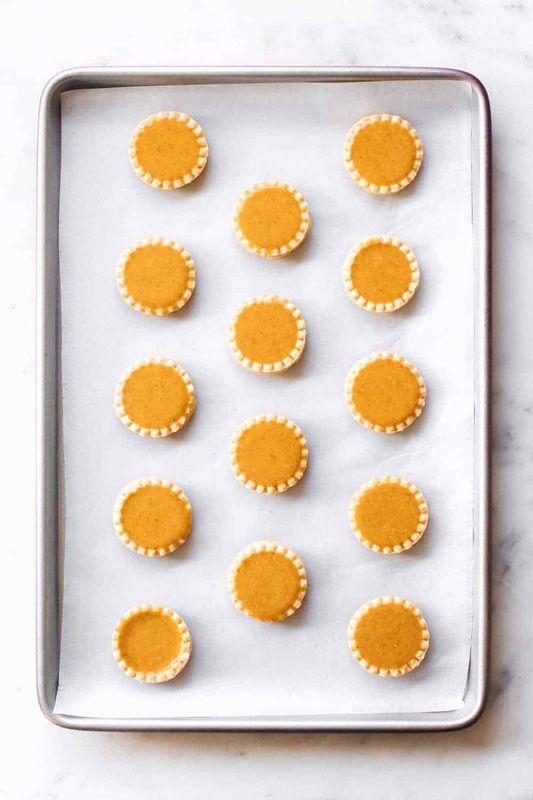 I find 15-17 minutes to be the perfect amount of baking time for these Mini Pumpkin Pies to get a beautiful golden shell and perfectly set filling. Baking time may vary depending on the brand of mini tart shells you buy, though. Pay close attention to the shell color during the baking process. You want the shells to be nice and golden – if they start to get too dark or are still pale after 15 minutes, you may need to adjust the baking time slightly. In a medium bowl with an electric hand mixer, combine sugar, salt, pumpkin pie spice, egg, pumpkin, vanilla, and evaporated milk. Beat until well combined and smooth. This post was originally published on September 20, 2012. The text and images have since been updated.